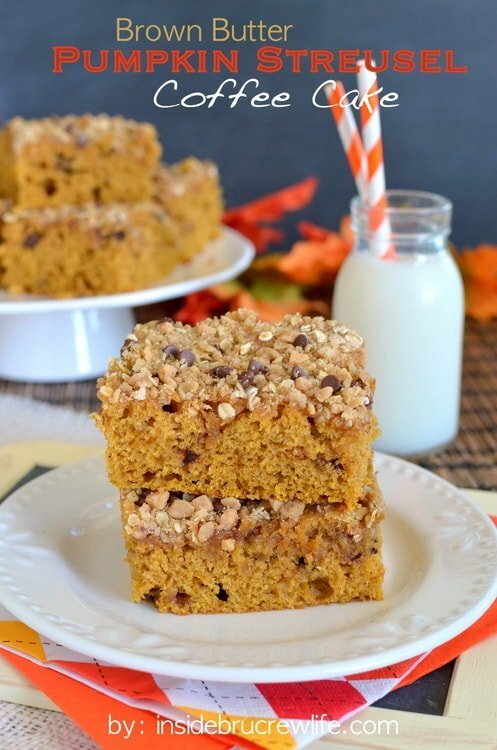 This kid and adult approved Brown Butter Pumpkin Streusel Coffee Cake is the perfect breakfast to wake up to in the fall. It would also be perfect for Thanksgiving morning. It feels like fall just got here and then left just as suddenly. We woke up to a light dusting of snow this morning. I am so not ready for that season yet. I want to enjoy the red leaves and the crisp air a little bit longer. So thank you for visiting winter, but really you can just leave because you are not welcome yet. To be quite honest, I would be happy to skip winter all together. Haha! Don’t tell my kids that! They live for snow! Crazy kids! I can celebrate Christmas in the 60’s just as well as I can in the 20’s, so I think I can live without all the cold and snow. The problem is that I am in the wrong state for that. Since moving is kind of out of the question, I just have to keep my self bundled and keep my little space heater with me in every room. Well, every room except the kitchen. I keep that room toasty with all the baking that I do. I do remember that I told you I was over pumpkin. But I have taken a break for a little while, and my pumpkin love came back! 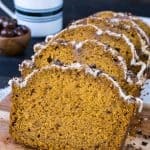 This pumpkin coffee cake starts out with brown butter. It is the yummiest thing ever to have in your kitchen. The smell is amazing when it turns brown. 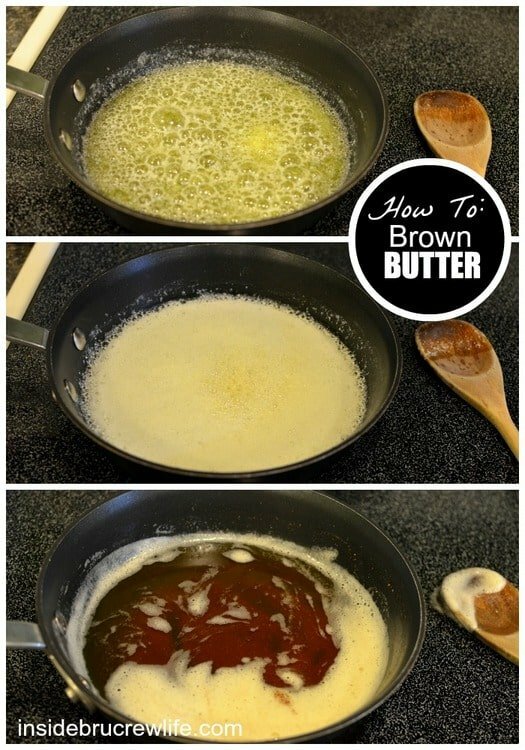 Here is a quick step by step picture of the different stages when browning your butter. Browning butter only takes a few minutes. First start with your butter in a skillet over medium heat. Melt the butter completely. It will start to get all bubbly. Keep stirring gently. The next stage is foamy butter. And then before you know it, the foam starts to disappear and the brown butter shines through. Depending on your recipe, you may need to let it cool a little bit before adding it to your other ingredients. I just pour it into another bowl and set it aside while I get my other ingredients out and get my pan ready. 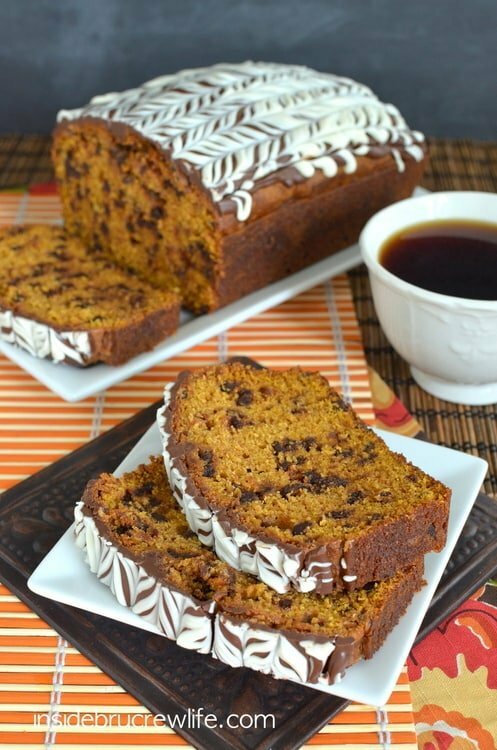 I made this pumpkin coffee cake for breakfast a while ago, and it quickly disappeared in no time. Even my husband enjoyed this one. He said he loved that it was simple…I think that was his way of telling me I make crazy wild desserts most of the time. But I am cool with that. That’s just me, and I don’t want to change that part of me. 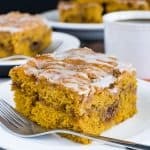 Brown butter and pumpkin make this coffee cake a warm and delicious breakfast for the fall mornings. Place the butter in a skillet. Heat over medium heat until melted. Keep stirring while it bubbles, foams, and turns brown. It will take about 5 minutes. Set aside to cool slightly. Beat the cooled butter with the brown sugar until it looks like sand. Add the eggs, pumpkin, and vanilla and beat again. Sift together the pumpkin pie spice, baking powder, salt, and flour. Slowly stir into the butter mixture. Do not over mix. Stir together all the topping ingredients. Stir half of the topping into your cake batter. Spread the cake batter in a greased 9x13 pan. Sprinkle the rest of the topping over the top. Bake at 350 degrees for 25 minutes. Let cool a little bit. Cut into squares and serve slightly warm. Store the cake sealed and on the counter. Makes 24 squares. No skipping summer!! Hehe! Thanks Jess!! 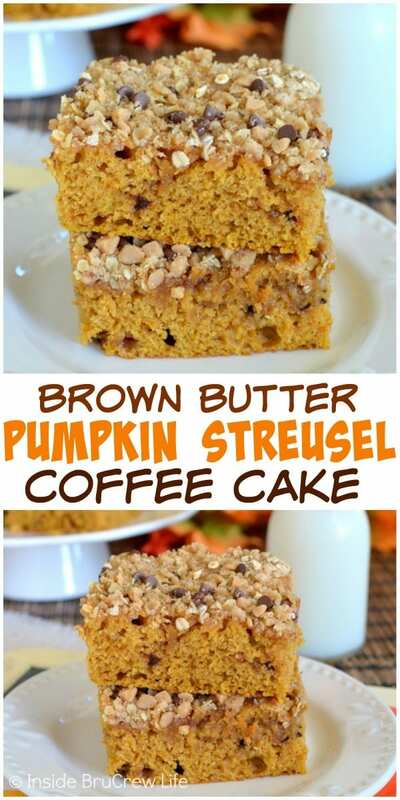 I think the Brown Butter Pumpkin Streusel Coffee Cake sounds amazing and really want to try it for my family. Now, the recipe says you put in half of the streusel into the batter, but looking at your picture it looks like you have a lot of the yummy stuff on top. Is it an accurate 1/2 amount, or did you make extra so that there would be a lot more on top. 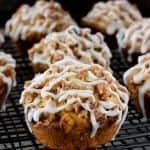 Just wondering as I have done this before on other recipes where I will even triple the streusel to put on top of stuff. Hi, Robin. Yes, the amount in the recipe is what I used…half in the batter, half on top. It kind of melts together onto the top. If you want more streusel, I say go for it! It will be good either way! We got so much snow 🙁 I’m with you its visited and it can now return and not come back. This coffeecake looks great. Yum! Christmas in California usually means 60+ I would love to see a white christmas though!! 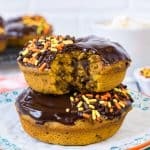 Streusel + Toffee Bits + Chocolate + Pumpkin = AMAZING!!!!!!! Wow. Browned butter + pumpkin = the world’s best combo. And in the form of coffee cake with streusel? Sign me up! I could do without the cold and snow too, but I definitely could not live without coffee cake! This looks amazing, especially with the brown butter!! Mmm!! I love brown butter! This looks perfect, Jocelyn! Around here, they talk about a few *flurries* and all of the milk, bread, and water disappears from the grocery shelves. 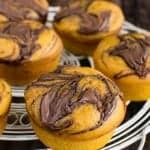 This coffee cake? MUST have. Must. Haha, we know what that’s like! Thanks Debra!! YUM to the brown butter in this coffee cake and the other tidbits like oats, chocolate chips, and toffee that you stuck into that streusel. This looks divine! I hope I wake up to this tomorrow! 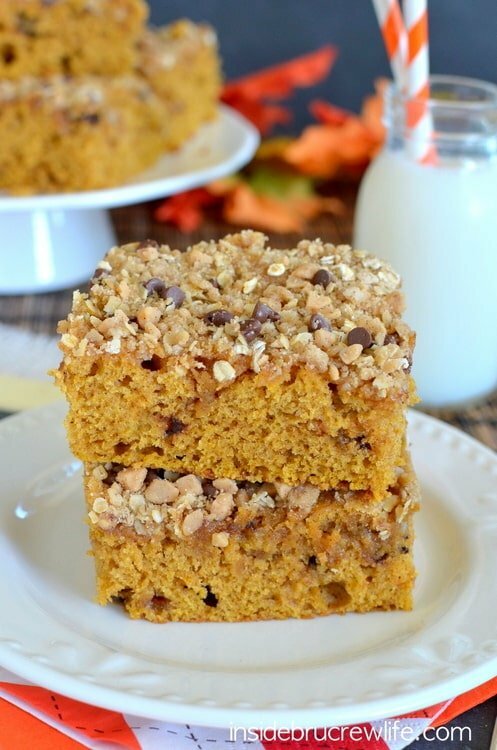 Brown butter and pumpkin, just a few of my favorite things! 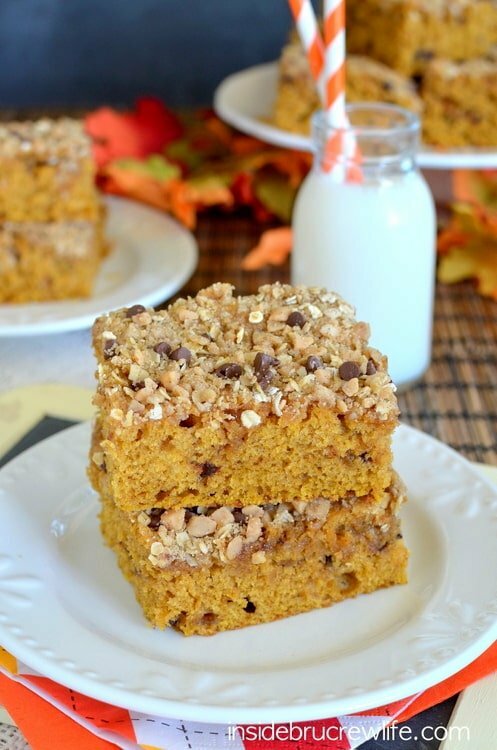 I am so glad your love of pumpkin came back because this looks amazing!! I also love the pics of browning the butter but have not tried because I was afraid to burn it! This is now on my to do list!! I love coffee cake. I really like the toppings you added to this one! I would be happy to skip winter, too (I kind of do since I live in Texas). 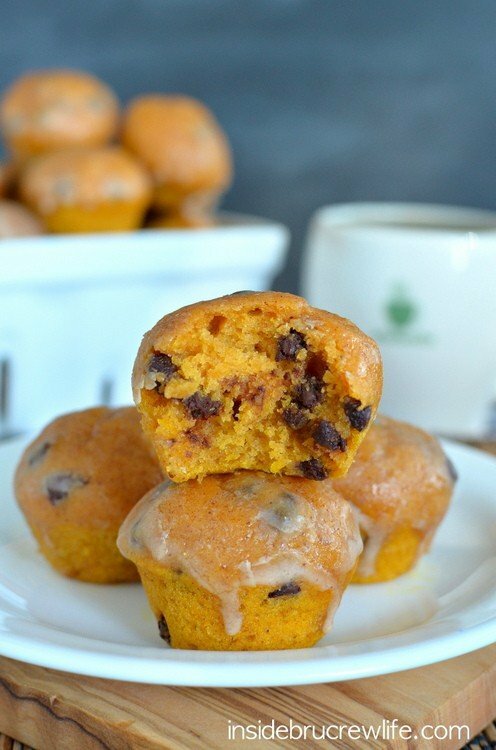 Love the combination of brown butter and pumpkin, and this looks perfect for a cold day! I would definitely be glad to skip winter altogether, too 🙂 Well, except that the cold weather is the perfect excuse to bake something warm and inviting like this gorgeous coffee cake. Brown butter makes my world go ’round! Brown butter and pumpkin sounds heavenly and your more than welcome to bring some of that snow to California. I will send it all to you!! 😉 Thanks Nicole!! I’m with you! I can do without the cold! But there was something strange about a 70 degree Christmas when we lived in South Florida. Especially when they made fake snow during a public event – fake snow, 70 degree weather and palm trees? Weird. But this cake is not weird – it’s awesome! And I love the addition of mini chocolate chips and toffee to the streusel! Yum! That would be weird!! Thanks Lindsay!! I’m glad you’re keeping the pumpkin recipes coming! It never ever snows here. Whenever it does, it’s gone in a few hours, but they cancel school anyway. 🙂 Luckily, this cake would be incredible with or without snow. Love all that streusel on top! Haha, that’s crazy!! It had to be really snowing good before they would cancel school when I was growing up! Thanks Beth!! Oh brown butter, how it makes everything simply magical. I wish we got more snow here. We’re lucky if we get a dusting. Usually it is just to warm on the valley floor here in Oregon. I’m so cold natured that I don’t think I could leave the house during the winter months if I lived in a snowy state. I would homeschool my kids and have my groceries delivered just to avoid it! 😉 As for this coffee cake? It’s going to be breakfast this weekend. Thank you much, Jocelyn! Haha!! Your a girl after my own heart!! 😉 Thanks Samantha!! 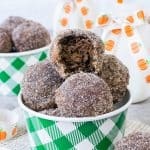 I absolutely love that you used toffee bits instead of nuts. Now if we can just replace all raisins with chocolate chips, I think we can achieve world peace. Totally in agreement with you!! 🙂 Thanks Renee!! 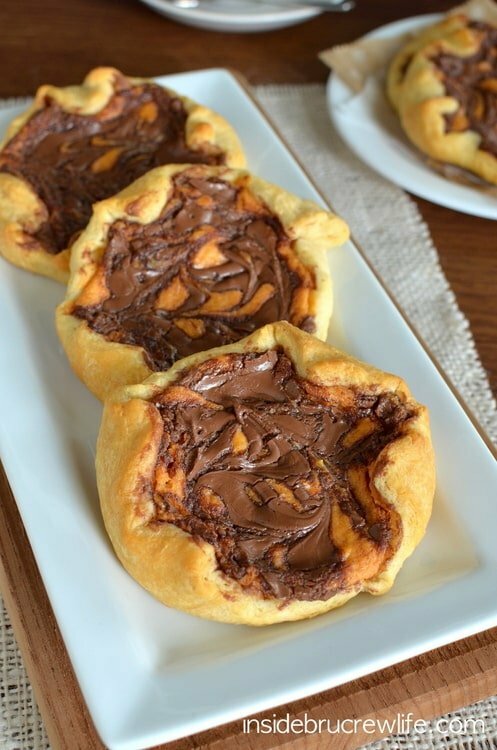 This recipe looks so amazingly fabulous! I love that you used brown butter…yum!!! Pinning for sure!! I love brown butter, but have never added it to a coffee cake. Clearly that needs to change!